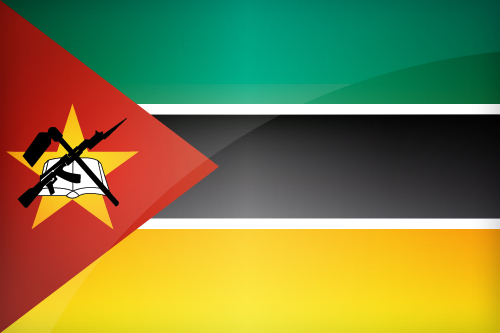 The flag of Mozambique was adopted on 1st May 1983. It is composed of three horizontal stripes at the wind : green - black - yellow, separated by small white lines. At the hoist, there is a red triangle pointing towards the center. It is decorated with various symbols placed on a yellow star. Colors are taken from the pan-African colors, and the flag was inspired by the Liberation Front who liberated the country from Portuguese rule. The yellow star symbolizes solidarity, the book for education, the rifle is an AK-47 that evokes the rough fighting that led to the freedom and the will of the people to keep it. The colors are also symbolic: Black (African continent), Yellow (Mineral wealth) , Red (Blood shed for independence), Green (Agriculture) and White (Peace established since independence). You can download it in different sizes, in a decidedly modern design for your personal use, or for wider use. Mozambique's flag is available in 4 different sizes. Keywords: Flag mozambique wallpaper, Mozambican, Republic of Mozambique, National mozambican flag, banner, pictogram, country, icon, Mozambique icon, international, Maputo, Maputo, Matola, Beira, Nampula, Africa. This page has been viewed 2988 times.